Let’s get, let’s get, let’s get, let’s get sauced! Let’s get, let’s get, let’s get, let’s get sauced! Does anyone else think Def Leppard may have chosen the wrong word for that song? I do. They could have had a #1 Summertime BBQ song had they chosen to sing about sauces vs. rocks. But I digress. I believe I’ve shared with you guys that finding condiments that taste good, have a decent mouth feel or texture, and don’t have a funky aftertaste has been somewhat of a struggle since starting our Real Food journey. I did find a great sauce from Outta The Park BBQ and I was able to make some really yummy BBQ Pulled Chicken. That sauce is a really good sauce and we enjoy using it when we want something unique. For the times that you prefer to have something homemade, however, I’ve got ya covered! There aren’t a lot of really good BBQ joints here in Minnesota so I did what a lot of people do. I found my sauce at the grocery store. And one by one each sauce we liked became infected with GMOs and High Fructose Corn Syrup. Talk about frustrating. When it comes to HFCS, we have a love/hate relationship. I love to hate the stuff. It’s rubbish. Don’t consume it. I beg ya. 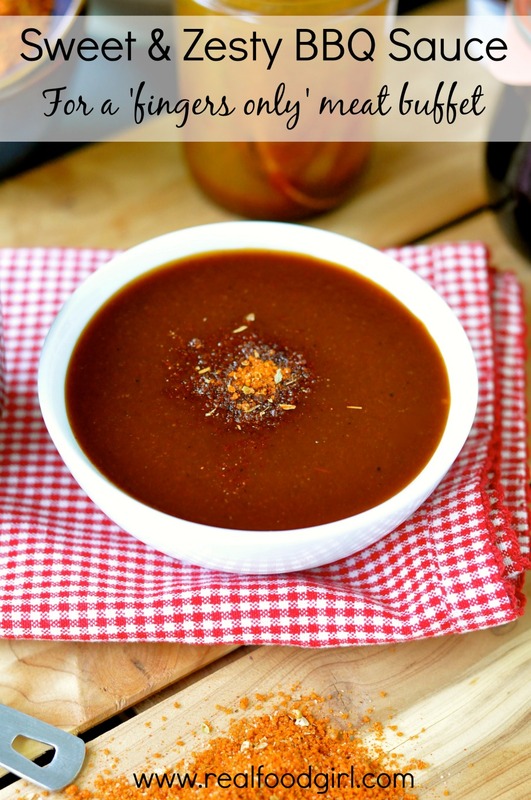 Because virtually every grocery store brand of BBQ sauce sold out to GMOs and contained garbage ingredients like HFCS, I knew it was time to make a homemade version that contained Real food ingredients. I’m not a big fan of the watery BBQ sauces, nor do I care for the mustard-y sauces. I like my BBQ sauce thick, sweet and with a little heat. What is your favorite style of BBQ sauce? Like most things that I end up making from scratch, BBQ sauce is not hard to make. The trickiest thing is getting the spices and seasoning just right so that you’ll want to slap it all over a glorious piece of grilled or smoked meat. My advice is to add the spices a little at a time, stir to combine well, and taste often. Feel free to experiment with spices to get the flavor that suits your tastes. There are so many spices, herbs and other aromatics that will help you achieve the sauce that best meets your needs such as ground mustard, sweet paprika, smoked/smoky paprika, white pepper, black pepper, red pepper/cayenne, onion powder, garlic powder, granulated garlic, oregano, ginger, yellow mustard, cumin, fresh garlic, onions, apple cider vinegar, honey, molasses… the possibilities are almost endless. I used organic spices, local raw honey from my friend The Bee Charmer, organic molasses, organic brown sugar, and organic ketchup. Homemade ketchup is next on my list because that has been another colossal disappointment since switching to organic, Real Food. I’ve tried no fewer than 3 homemade ketchup recipes and we haven’t liked one of them. To make matters worse, TSM only likes Heinz Ketchup (organic) but I’d rather not support them with my wallet. I used to buy Annie’s Organic Ketchup, but since they sold out to General Mills, I want nothing to do with them. It’s getting harder and harder to find simple convenience foods that can be done with real ingredients, no chemicals and only minimally processed. Not everyone has time to make everything from scratch. I sure don’t. I wish I did, but I don’t. We’ve used this sauce on ribs, burgers, BBQ Chicken Pizza, BBQ Baked Beans, and lastly, grilled BBQ chicken. We love it. Ya can’t go wrong with this sauce. Make it as spicy or as sweet as you like, but I know you’ll enjoy it. 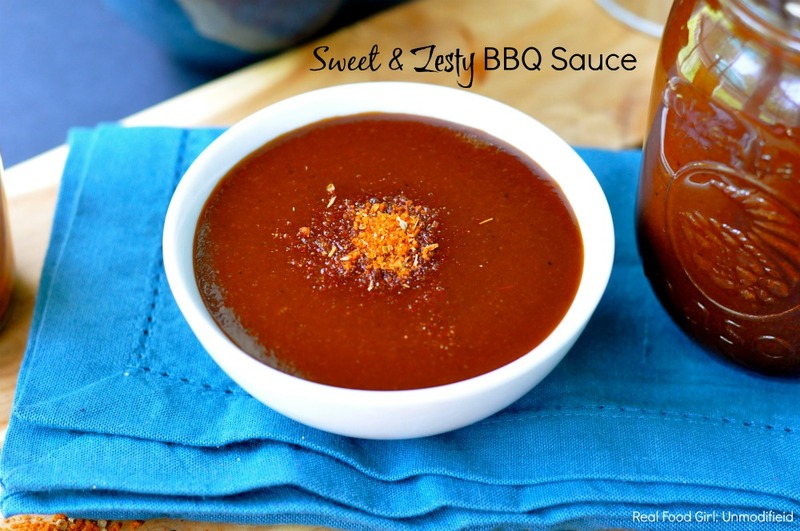 I know BBQ sauce is intensely personal and everyone has their favorites, but what is great about my Sweet & Zesty sauce is that it is a solid base recipe that you can personalize all you want. So go have some fun and fire up the grill!! Do you make your own ketchup? What about your own BBQ sauce? Do you have one trusty recipe, or do you have more than one? I’d like to hear from you. Comment below. 1-2 TB of diced chipotle pepper for smokiness and heat--if you don't have any peppers, start with 1/4 tsp. ground chipotle powder and go from there. Put the ketchup, water, and half the brown sugar and/or honey into a small saucepan over low heat. Stir to combine. Give it a taste--for reference. Add the remaining ingredients (if there is a range use the smallest amount first) and stir to combine. Turn the heat up to medium low and let the mixture simmer for 10 minutes. Stir often. Give the sauce a taste and if desired add the remaining higher amounts of ingredients (such as more apple cider vinegar, more cumin, more ground mustard, more molasses). Let it cook for another 2-3, stirring frequently and taste again. Adjust the flavors if needed by adding more of any of spices listed above. Continue to cook for another 5-7 minutes until the sauce has reduced and thickened. Store in a glass jar. This will keep in the fridge for up to 10 days or can be used immediately. I use organic, non-radiated herbs spices whenever possible, or I use home grown. Woohoo! I have been hunting for a homemade barbecue sauce with very little added fat for days. Thank you! I’m sharing this as Recipe of the Day with my peeps on a Facebook page I curate called Cooking with Whole Grains & Real, Whole Foods. Thank you so much. Just in time for the BBQ! 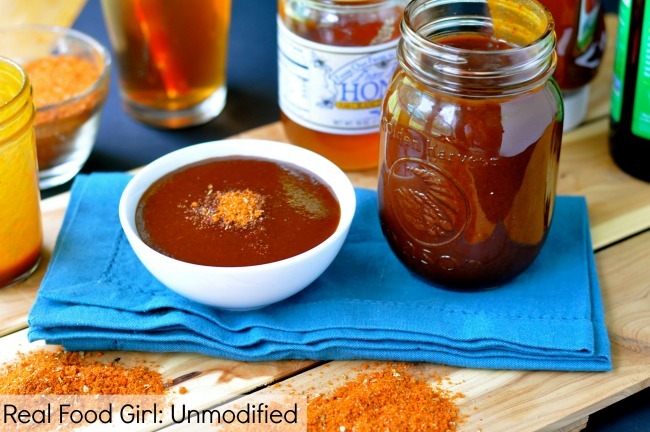 Thanks for the mention of Outta The Park BBQ Sauce, Real Food Girl: Unmodified! Your homemade recipe sounds terrific with the cumin and chipotle peppers. 🙂 You are very welcome!